A little while ago, I got the chance to visit Los Mexikas in Bratislava. It is a Mexican restaurant located in the heart of the city, and I actually read some good reviews of the restaurant on TripAdvisor before making the visit. We were fairly hungry and ready to eat as we arrived in Los Mexikas in Bratislava. It was a windy and grey afternoon, so we had to sit outside. The first shock came before entering the restaurant. The pictures of the food on the outside had terrible quality, and my companion said that a restaurant with such pictures of the food outside, is a restaurant to avoid. But, I had read some good reviews, so I convinced my companion to join me for a dinner in Los Mexikas. But, I had to agree… the pictures portraying the food on the outside looked terrible! Safely on the inside, we got a menu and sat down to eat. The interior was okay, but nothing special. The waiter was really eager to help us out (in a way I would say too eager). We looked through the menu and noticed that the prices were very similar to all the other restaurants in Bratislava (that looked way better). My companion wanted to leave the restaurant again, but once again, I convinced her to stay with me! After a while, we ordered our food, and it was quickly served. I don’t like to be negative, but to be honest, the taste in my mouth felt somewhat similar to the quality of the pictures of the food on the outside… I like Mexican food, and I want to be as positive as possible at all times, but this was food that was hard to like and to enjoy. The picture above might look okay, but the taste wasn’t at all as good as what it looks like on the picture. I am not sure what was missing, but it simply wasn’t a tasty and good experience. Your thoughts of Los Mexikas? 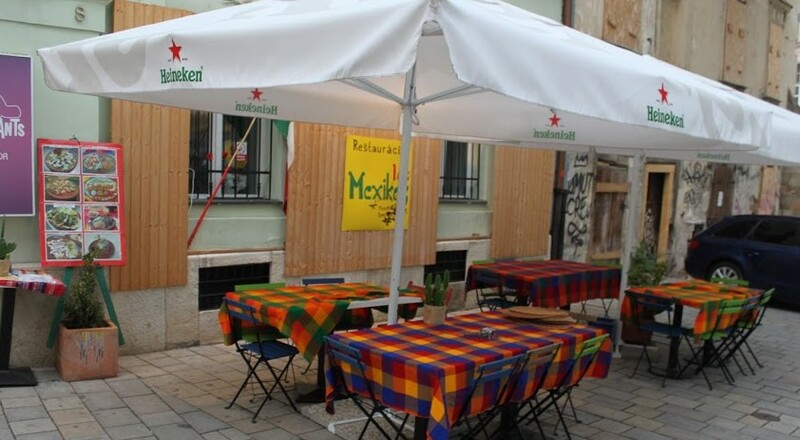 Have you been to Los Mexikas in Bratislava? How did you enjoy the meal? Were we unlucky, or did you have a similar experience as we did? I would love to hear your thoughts about Los Mexikas!